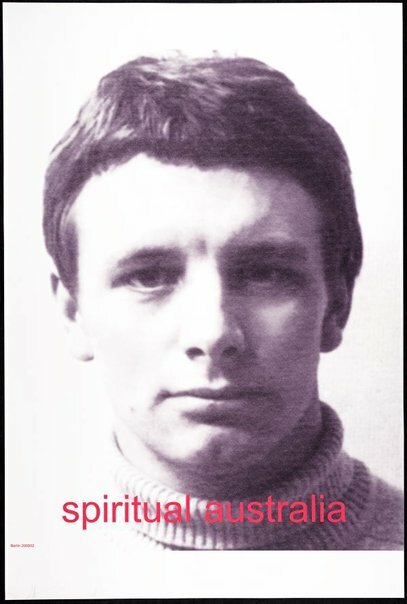 'Spiritual Australia #1' features a photograph of Australian artist Robert Hunter appropriated from the catalogue for the The Field exhibition, held in 1968 at the National Gallery of Victoria and the Art Gallery of New South Wales. This important exhibition featured artists working with hard edge abstraction, seen as a contemporary international style but one which was most artists moved away from soon after the exhibition. Hunter however has adhered to minimal hard edge painting throughout his working life. Redford has said about this work, "... those great shots in The Field where the artists look like ANZAC soldiers or footballers... that piece was about Australia, about being homesick - it was made in Berlin." (Bricks are heavy, IMA. Brisbane, p 73). Redford makes reference here to the connection often made between abstract art and spiritualism, and also to an artist who is perhaps one of his heroes. Bricks are heavy , 2006, 73 (illus. ).